NORTHBROOK, Ill.--(BUSINESS WIRE)--Ninety-five percent of consumers want to be left alone while shopping unless they need a store associate’s help, according to a new consumer survey by HRC Retail Advisory, a leading strategic retail advisory firm. According to the survey, many shoppers are moving away from the hands-on, personalized service from store associates, and instead turning to their friends and family via social media to share pictures and gather opinions before they buy, particularly in apparel. To better understand what drives shoppers into stores, and what they like to see when they get there, HRC recently polled 2,900 North American consumers about their shopping habits and preferences, revealing that a majority of shoppers are looking to in-store technology for customer service. In fact, approximately 85% of consumers surveyed want to be able to check prices at price scanners throughout a store rather than having to ask a sales associate for pricing information. Further, 69% of shoppers said that being able to order a technology product online and then pick it up in store is important (likely where they can see it and test it before buying), with a similar 65% saying it is important for apparel. 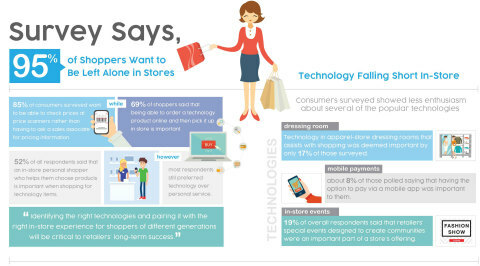 Conversely, while the need for store associates is diminishing overall, nearly 52% of all respondents said that an in-store personal shopper who helps them choose products is important when shopping for technology items. However, most respondents still preferred technology over personal service, as a much higher 76% of overall respondents rated an in-store app that will provide personal recommendations as important. Dressing Room Tech. Technology in apparel-store dressing rooms that assists with shopping was deemed important by only 17% of those surveyed. And only 6% of respondents ranked customized lighting in dressing rooms as important when shopping for apparel and shoes. Mobile Payments. Mobile payments ranked only slightly higher, with about 8% of those polled saying that having the option to pay via a mobile app was important to them. In-Store Events. Only 19% of overall respondents said that retailers’ special events designed to create communities were an important part of a store’s offering, particularly when shopping for apparel and beauty products. Events may grow in importance in years to come, however, as a slightly higher 24% of Generation Z listed them as an important store feature. Mobile Promotions & Sales. Nearly 34% of all respondents ranked receiving promotional and sales information sent directly to their smartphone upon entering the store as important. Mobile Point of Sale. Nearly 30% of respondents said that being able to pay a sales associate from anywhere in the store was important, an indication that digital scanning technologies will play a growing role in retail. Social Media. Nearly 70% of Generation Z and 63% of Millennial respondents are turning to social media to share pictures and gather opinions from their friends and family before they buy, particularly in apparel. Wi-Fi. Free in-store Wi-Fi was ranked as important by 30% of respondents overall, and the rate was higher among younger generations, who tend to seek opinions from their social networks and share photos via social media when they shop. In-Store Apps. About 29% of overall respondents ranked in-store apps that would provide personal recommendations as an important store feature, versus only 17% who ranked sales associates that would help you choose as important. Reserve online, Pickup in-Store. Being able to reserve apparel online, and try it on in-store before purchasing was ranked as important for 42% of Millennials, and 38% for Generation Z.
HRC Retail Advisory’s survey was conducted online February 20 – March 7, 2018. The total sample size was 2,903 U.S. and Canadian consumers ages 10–73 (with those ages 10–17 recruited to participate through their parents). HRC Retail Advisory is a leading strategic retail advisory firm based in Northbrook, IL, that helps retailers unlock value across key operating functions, including helping them develop efficient cost infrastructures to transform their businesses, enhance their merchandise strategy, optimize their margins and inventory, merchandise planning and allocation and transforming store operations structures, processes and tools to most profitably serve the omnichannel consumer. For more information, visit www.HRCadvisory.com. Ninety-five percent of consumers want to be left alone while shopping unless they need a store associate’s help, according to HRC Retail Advisory.